Lobster diving or is it hunting draws big crowds down to the Florid Keys from October Through March. Lobsters can be caught in relatively shallow waters of about 5 or 6 feet, requiring only snorkeling gear. However, it is very popular for scuba divers as well. The lobster diving season is known among divers for the relative frequency of diving accidents that occur. It has been found that the majority of these incidents occur typically at the beginning of the season. Florida has 2 mini lobster seasons which is usually the last Wednesday & Thursday in July and the regular 8 month lobster season is always August 6 through March 31. You can verify the dates as well as regulations with the Florida Fish and Wildlife website. Unlike snorkeling, scuba diving gear comes with additional responsibilities and technicalities that require a n additional amount of preparation and attention on the part of the diver. Perhaps the thrill and competitive rush of lobster diving makes it easier to overlook the requirements of proper preparation which results in increased diving accidents. 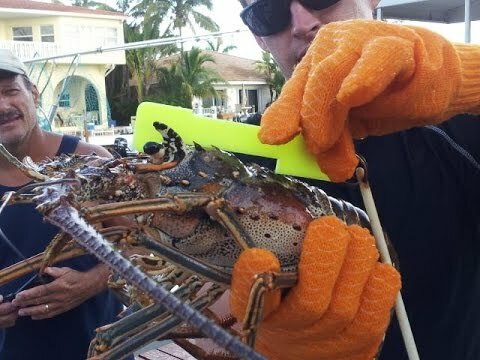 Watch the video below for tips about catching lobster in the Florida Keys. Galvanized Wire Handle Mesh Bag with metal locking clip and D-Ring. Two sizes are available 15″ x 20″ and 18″ x 28″. Heavy duty mesh bag with large D-Ring. Perfect for use as a clam bag, lobster bag or spearfish bag. Hey guys good video, you certainly know your stuff. I guess the only issue I have is that standing on and kicking the coral isn’t a good thing.